We happen to think the Toyota Avalon rules. However, if you need front-drive comfy cruiser with a little more flash and a long warranty, the new 2017 Kia Cadenza is a nice alternative to Toyota’s official car of AARP card holders. For 2017, Kia made the Cadenza meaner, lighter, more powerful! But let’s be real, people that buy this car don’t care about the extra three horsepower from the 3.3 liter V6. The probably do care about the increased fuel-efficiency due to Kia’s first ever eight-speed automatic transmission designed for front-wheel-drive cars. It’s gearbox that Kia claims is even lighter than the previous six-speed auto. 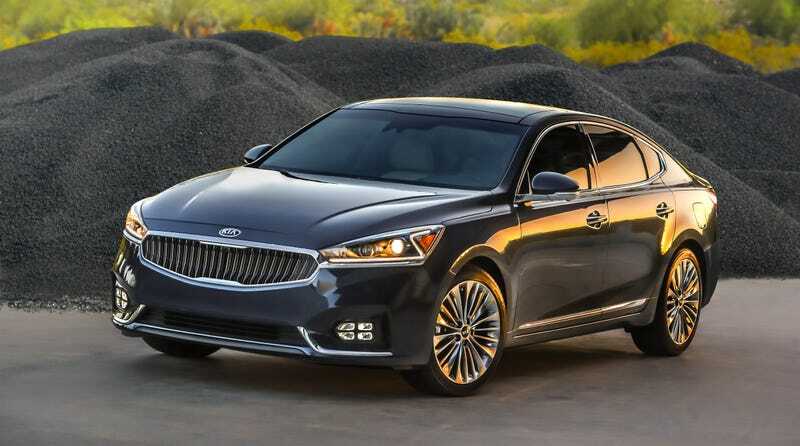 According to the EPA, the new Cadenza should achieve 19 MPG city, 28 MPG highway, and a combined rating of 22 MPG. On the inside buyers will notice a bit more legroom thanks to a slightly increased wheelbase. In typical Korean fashion, Kia will offer all kinds of tech and features at a lower price point than its competitors. On the 2017 model, you will find more soft-touch materials in the cabin, Napa leather seating, with available quilted seat bolsters accented by diamond shaped stitching. For the tech savvy types, the new Cadenza is now available with a wireless cell-phone charger, Head-Up Display, Kia’s UVO infotainment system with Apple Car Play and Android Auto, a Harman/Kardon stereo system and a nifty feature called Smart Trunk, which conveniently opens the trunk lid if the sensor detects the key fob for more than three seconds. Of course, the new Cadenza will also come with the trending advanced safety features such as: Forward Collision Warning and Autonomous Emergency Braking, Lane Departure Warning in addition to the Smart Blind Spot Detection System which senses unintentional drifting and automatically brakes the opposite side front wheel to help maintain the vehicle’s intended course. Since this is not car for hunting apexes, but rather soaking up the miles, Kia retuned the suspension with Amplitude Selective Damping shock absorbers that maximize ride comfort without sacrificing stability. The new shocks feature something called Hydraulic Rebound Stopper, which works to provide a smoother ride over harsh or broken surfaces. Do you hate potholes? This is your car. I caught some heat a while back by calling the Cadenza, “the 5-series for people who aren’t shallow” and I stand by that. The vast majority of buyers in that category just want something nice and comfortable. They don’t give a crap about “dynamics.” Many of them would be perfectly happy being stuck in traffic with a Cadenza if they weren’t so hung up on having a fancy badge.